Bonus Information: Unibet offers a range of promotions and bonuses for new & existing players. For the latest information visit the promotions page to see the current offers. 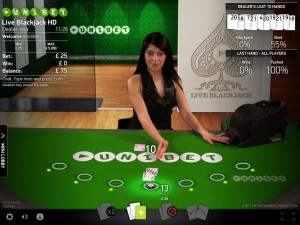 Unibet operate 2 live casinos and both offer live blackjack. Their Casino Grande is an Evolution gaming live casino and here they offer standard 7 seat blackjack, with side bets. They offer a wide range of tables including dedicated ones, so it’s fairly easy to find one that matches your stake levels. There are a number of VIP tables for high rollers. The Casino Royale is a Net Entertainment live casino and I’m pleased to say that there’s a dedicated 7 seat blackjack table in addition to the common draw blackjack game. This is a great addition and for me now makes playing at a Net Entertainment casino a viable option, as I don’t like the common draw game. It’s a shame that the Comeon Live casino hasn’t done the same!. There are no side bets on offer, however the stake range is broad so that should keep most players happy. 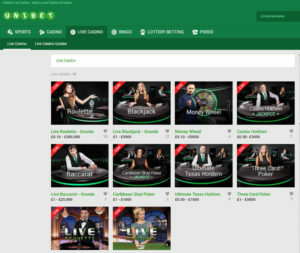 A quick look at the features of each casino show that from a rules perspective the Unibet Live Blackjack at Casino Grande (Evolution) offers the best game. You are not restricted on where you can double and the dealer takes two cards instead of one. This means that when the dealer draws an Ace the insurance bets are dealt with immediately and if the dealer has Blackjack the game ends without any further betting taking place. In my opinion a much better scenario than when the dealer plays last if his first card is an Ace. As I’ve mentioned before this casino uses Evolution Gaming software for its live casino games. 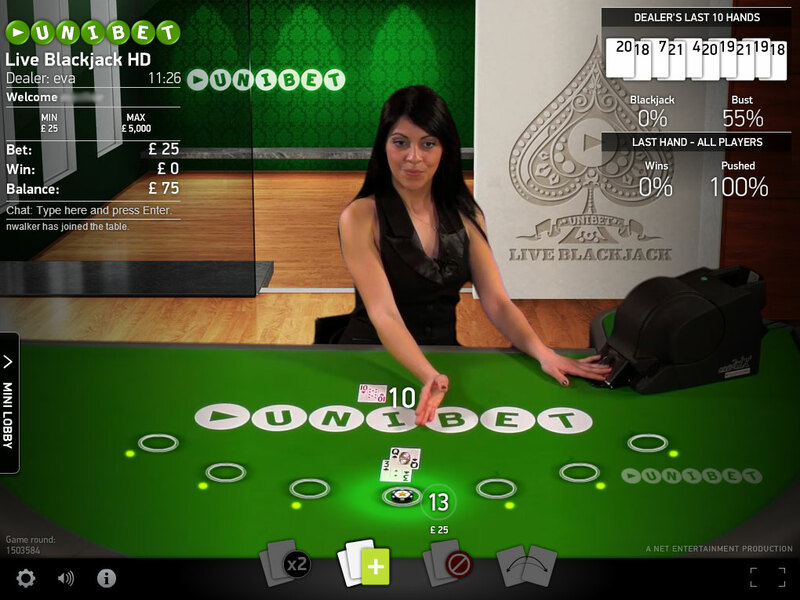 7 Seat Blackjack is offered and you can play this on either a dedicated Unibet Live blackjack table or one of the Evolution generic tables. 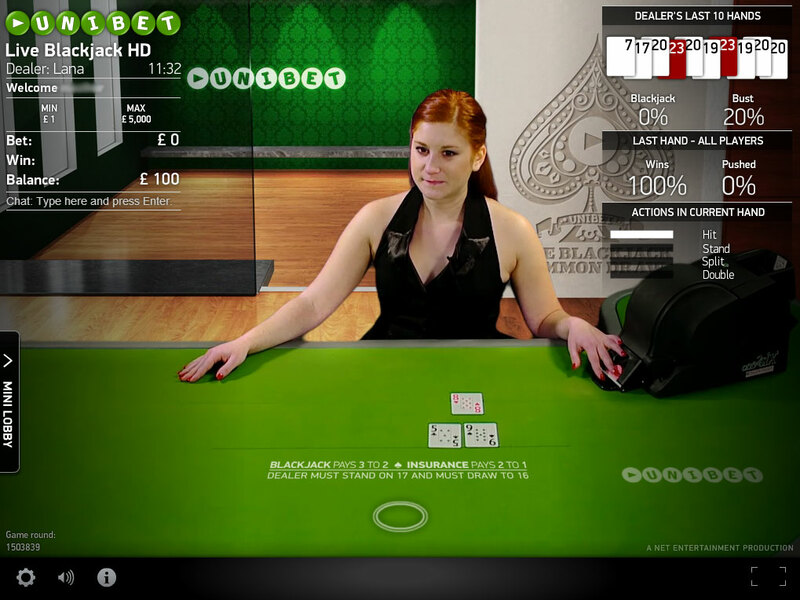 Having dedicated tables is a real bonus as it means you are more likely to get a seat and the dealers represent Unibet so you get a better playing experience. The software interface is great, with all the information you need to be able to tailor the viewing requirements to your taste. I prefer playing in full screen mode. The other great thing with this software is that you can play at multiple tables and have them displayed to you in one window. So if you like multi-hand or multi-table then this is a good place to play. Side bets are available at both types of tables, you can bet on Bet behind, Perfect Pairs and / or 21-3 (Rummy). This is a fairly new addition to Evolution tables and one that has been long overdue in my opinion. Now if I’d written this review a few months ago, I would have been saying that whilst Net Entertainment have a great looking product with a fantastic interface, they just would not be able to cut it with their competitors while they only had Common Draw Blackjack. Well that has changed and live casinos can now (Jan 2014) opt to take 7 Seat Blackjack, which Unibet have done with their very own dedicated table. When I played here it was pretty quiet, but I can imagine that it will get quite busy as the word gets about. 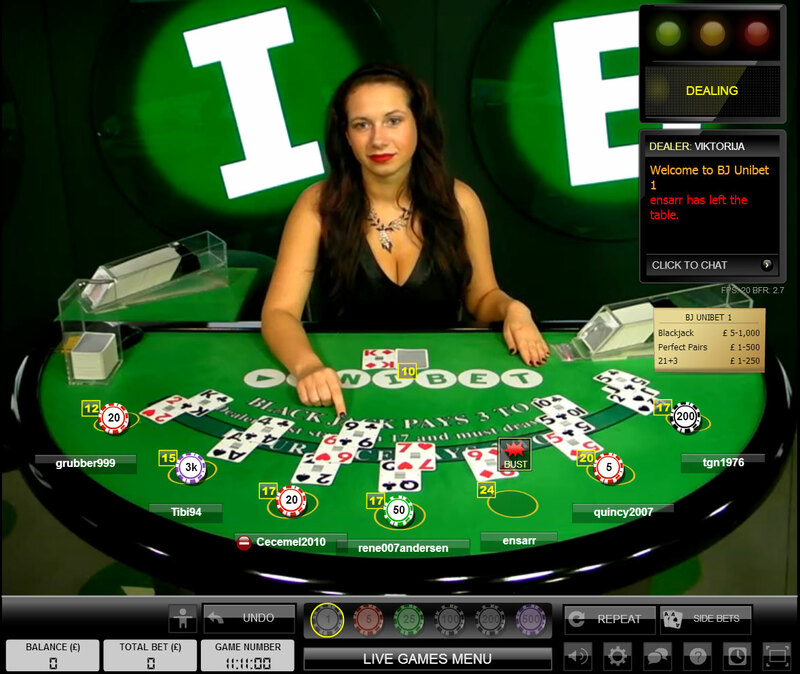 I like the look and feel of the Net Entertainment blackjack, the interface is modern and uncluttered. I personally have reservations about playing with a Shufflemaster Dealing shoe, in so much that it’s effectively a new shoe after each hand, so past cards dealt have no relevance to future cards. I also prefer the dealer to take two cards as part of the initial deal rather than one that is the case here. However saying that you will still get a fair game and is a great alternative if you don’t fancy Casino Grande. A variety of payment options are available and they are listed in more detail above. You need to be aware that there is a 2.5% commission fee on some deposit types. I use my Visa debit card for deposits and withdrawals and these are handled free of charge. Withdrawals can take a few days to get to your bank account. They are not the quickest of payers, but certainly not one of the slowest. To date I’ve not been asked for id documents, I guess that’s because my withdrawals have been quite small :-(. Unibet offers a range of promotions and bonuses for new & existing players. For the latest information visit the promotions page to see the current offers. Comp points are also awarded and they can be exchanged for free spins or cash. You can contact support 24 x 7 by phone, email and live chat. They are normally pretty quick to respond and I find them to be very helpful when I had an issue with my logon. The Unibet Live Casino is very popular, it’s always busy when I have been online, but I’ve still managed to get a seat at the dedicated tables. My favourite Blackjack Casino is BetVictor, but Unibet have become a close second in recent months, so much so that I now regularly switch play between the two. I don’t think you can go wrong with Evolution Software, so with that and a trusted brand I’d recommend Unibet Live Blackjack to anyone looking for a good game.